A friend invited me to attend a gathering at her place to meet the incredibly gifted writer, Rasha who wrote Oneness. I came across the book over two years ago while walking the aisles of Barnes & Noble. Searching for spiritual answers that summer, I browsed through the metaphysical area when Oneness fell off the shelves onto my feet. The Divine always works in specific ways with me and books, sending me messages from beyond. This book has become a metaphysical bible of sorts which I return time and time again for answers. Each time I re-read a passage something new shifts. It is an experience to immerse in such language full of truth and wisdom. I was delighted to be able to be in this beautiful woman’s presence. When she arrived, wearing all white, vowing her head into her palms together while whispering, “Namaste…” I felt a pull from Source. I cannot describe this in a terms that won’t sound hippie or woo-woo. I saw her energy enter with authentic truth…and love. It’s rare! It’s extremely rare to see this so clearly in strangers, especially those who label themselves as enlightened, awakened, or whatever they are selling through the process of society and materialism. This wasn’t the case. Rasha sat with a humble smile and we began to discuss her books and the journey her life took after writing Oneness. Her humanness allowed me to put my guard down. A very shy woman who speaks in a low tone I began to feel uncomfortable. Not many people know that as of the beginning of this year I began to lose my hearing in my right ear. As of this summer I cannot hear at all. Now, this presence sat across from me, speaking ever so slowly and in a whispering tone that I felt the rush of anxiety for not being able to hear her properly. What would I miss? What message won’t I catch while reading her soft lips? I asked her a question and became aware of forcing my body to be on alert to hear from my other ear while making sure I am reading facial expressions. But, something happened as she answered this important question. She stared into my eyes and my right ear popped. A sharp sound took over for a second. Then I heard everything as clearly as I have not in over nine months. It was so crisp that my eyes watered as her message truly became the foundation of truth for all that I needed to hear. I heard! I sat there with a message of empowerment. I did not share my hearing loss. I did not share every imaginable thought I had after that moment in the shock of sound entering this space in me. I was elated and surprised and grateful. I heard! I listened to her story and how these messages from divine wisdom are not hers but utilize Rasha (the woman) as a vessel to pass it on to others. Mesmerized by what I needed to hear, I was moved to a place of oneness and the power of healing. “I know this”…I kept thinking. “How have I allowed for this loss of sound to go on for so long?” I know when it began. I understand the blanking out of noises that become toxic in our lives. I get the avoidance. I completely get the holistic lesson in this dizzy imbalance body that can’t find grounding because of not hearing from one ear. But, there in a place of safety and wholeness, I was able to hear The Great Mysteries of Divinity speak through this soul. There I was whole and alive and able to comprehend even the softest and quietest of words. The powerful thing about her books, especially Oneness, is that you have to be ready to embark in the journey. It will open you up to some major shifts. I read it six months before my near-death experience. This summer I read her other book, The Calling. Each one of her books is mystically encoded with a high vibration and frequency to push you into opening to your higher consciousness. Being in her presence I felt that message of an expanded awareness and acceptance. She is elevated and even in her human state there is definitely something of great mindfulness. She is the embodiment of all she writes. She expresses the Oneness of all we are and what we are to Source. I have been in the presence of many who call themselves gurus, spiritual teachers, healers, facilitators, empaths and intuitives. This woman needs no label. She is living the life of humility and humbleness on a mountain in the south of India. Her story is me, you and them. There is no separating the body from the spirit…she has allowed herself to be of service through words. If only! If only we were brave enough to follow such a difficult path in a world that judges, scrutinizes and discriminates. I applaud this soul. I was flying high as I left downtown Asheville. I could hear all. I heard the folks talking outside the restaurant. I heard the sirens in the distance. I heard my breathing. I heard sounds that I have blocked while utilizing only one ear. I got in the car and turned on Sarah Brightman on my ipod while following the moon over the mountains until another pop took a hold of my ear and bang! All hearing was lost again. I shook my head, stuck my finger in the ear, tried to unblock it but it was too late. I covered my left ear and I couldn’t hear the music. But…but it is better than okay because something in me remembered the reason I have not been hearing until there is something of importance to remember again. Staying in the oneness of life and truth is not easy. My few hours with Rasha did allow me to vibrate at a higher frequency. I felt a charge. I felt a surge go through me and my heart expand to all there is with love as she spoke ever so softly while pausing and inviting every sense of our presence into her world. I am grateful to my friend for the opportunity to witness this mirror image of pure love and light. 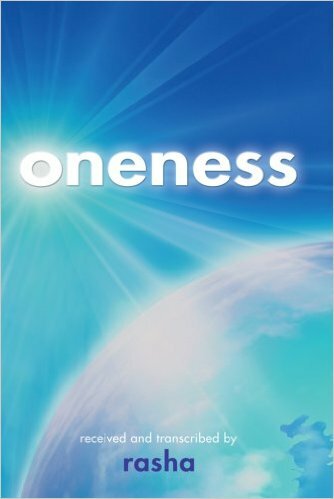 I will be picking up Oneness again and re-reading it. It’s time for another journey into the great mysteries of this earth.